The END of all Tantrums | "A Beautiful Place of the World"
A tantrum is generally defined as “a violent demonstration of rage or frustration; a sudden display of bad temper”. When you dig deeper, you’ll discover that a so called “bad temper” refers to a “persisting angry mood”. And if we put that back together, it becomes a bit easier than usual to see that what we call tantrums are literally our children showing us that they are having enduring angry/upsetting emotions — that is, they are “sudden[ly] display[ing] [their] persisting angry mood”. 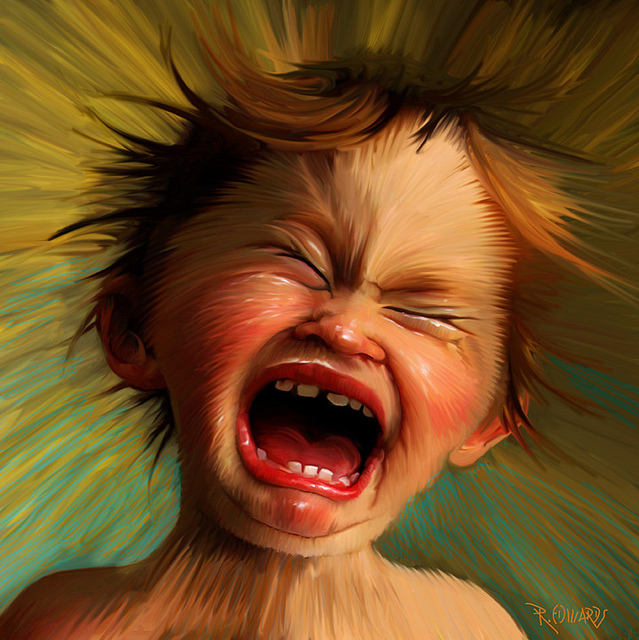 Over time and as a result of societally-induced semantic diffusion, we have come to call any expression of unsettling emotion a “tantrum”; and we regularly intend a derogatory connotation to go along with it — even going so far as to use the term when speaking of adults to mean “any childish fit of rage or outburst of bad temper”. It’s a catchall term, to put it mildly, for any time we don’t like the emotional expression of someone else, especially if we want them to stop it. You might be thinking — “Um… So?” — after all, who’s to say it’s a big deal that we overuse a word like tantrum, or even if we culturally decided to add some negative import to it as well? The trouble is, though, that as long as the word comes with the heavy judgement now associated with it, any use of the word carries that judgement. I’m sure you can think of other examples of the same thing in our collective word history… The point is, our intentionally negative and over-use of the word “tantrum” is overtly involved in formulating and maintaining the perspective that our children’s emotive expressions are “bad behavior”. Prejudice of that caliber will never do us any favors in parenting our kids, especially since it’s part of our job as the parents to help them learn how to manage those emotions, but it can, and I’d say that socio-historically it certainly has, made our parenting work more — well, work. All tantrums are just expressions of emotional processing. Period. Without the kind of judgment that gets slapped onto them when we use the word “tantrum” to describe them, emotions and their expressions are just what they are. And again, it’s one of our main parenting jobs to help our kids process their emotions and learn socially-conducive manners of expressing them, in the first place — if we don’t like the emotion(s) or the expression(s), then we need to take responsibility for both, not blame our kids for being emotional and showing it. In truth, we should thank our kids every time they have an emotional outburst, because of its potential to beneficially guide our parenting. If and when a kid has an actual tantrum — a by-the-book “violent demonstration of rage or frustration” — s/he has suffered a neuro-emotional meltdown. It may seem intense from the outside, but it is emotional hell for them on the inside. The ability to access the higher, executive-functioning portions and mechanisms of the brain is almost completely lost to a young kid having intense emotion. First, the emotional portion of the brain takes over — in order to secure the kid some assistance through emotional-connection mechanisms — and if that doesn’t work (either in the moment, or habitually), and/or if the kid gets too stressed-out during the emotion, then the instinctual, fight-or-flight, survival portion of the brain usurps control and begins it’s “violent demonstration”. The brain only drives the kid toward such a display in order to get help. St/age-specific periods of “tantruming” are common and even less controllable for our little ones. It may coincide with a particular brain development stage that interrupts or complicates emotional processing — the so-called “terrible twos” represent a version of this, wherein the brain is simply going through a developmental shift that unsettles the evolving balance between the lower (more instinctual, emotional) portions of the brain and the higher (more rational) portions that will later be in charge of the lower portions (if development goes properly). These periods can be long, short, and/or episodic, and during them it simply doesn’t make sense to try and hold our young kids accountable for consistent rational functioning, or being immediately able to control themselves during upset; later st/age-specific types of “tantruming” — see any teenager anywhere — are no less overpowering to children’s brains, but if we’ve helped them manage emotion earlier in life, then they will have a much easier time handling themselves as they mature (not to mention that by helping them process their emotions throughout, we are nurturing that ever precious parent-child bond). Serious, chronic “tantruming” is a clear sign of a systemic emotional processing struggle. There are different versions, but essentially, something in the manner in which the child has been led to develop — possibly in-utero as a result of stress the mother endured; or maybe during the first days, weeks, and months after birth when the instinctual brain desperately needs to be placated with a resounding broadcast of safety and security; or in the months or years that followed, when the emotional brain just as desperately needs connection, consolation, and empathy in order to navigate the intense overwhelm of nearly every emotional process — has led to making emotional expression more, shall we say, expressive. When there is an interruption in and/or to whatever degree there is a lack of support in those periods and circumstances, then the child’s ability to deal with future emotions and instinctual-fear responses is thwarted. The volume gets turned up on the emotions to inspire greater connection, better parental address, and fuller release of emotional baggage from previously under-addressed episodes. One of the bottom lines here is that all emotion and emotional expressions, “pitching a fit”, “being a fussy pants”, “having a hissy”, or “throwing a tantrum” have the same ends — the development and maintenance of an optimal neural network — one that can manage a wide array of tasks, critical thinking, and problem-solving, as well as process the moment-to-moment experience of life in the best possible way for the current circumstances. That is, think rationally through emotional times and even in times of fear, unless it’s safer to just instinctually react — a decision that the healthy brain makes flawlessly without our conscious involvement, but an unhealthy brain will habitually incorrectly make in favor of fight-or-flight type responses. Early on in development, one of the main ways children’s brains manage this process is by using emotional expression to get connection so that the child can get external assistance in stabilizing during emotional upset — this assistance (coming from us) helps the child’s brain form neural habits of top-down processing, and the ability to cope with future emotional processing and mitigating instinctual fear in healthy ways. If we do our part in this well, then as our children age and become more and more capable of higher executive functioning and self-managment, the neural habits we’ve helped them shape will serve them in processing and regulating their own mental states with greater success and flexibility. In later parts of their development they either capitalize on our efforts, or suffer from them (taking us along for the explosive emotional ride…). In honour of the importance of all of the above, and again because I think that the judgement that tends to come along with it is problematic in terms of what we want for our kids — I have given up using the word “tantrum”. I don’t think we can afford to project that judgement toward our kids’ emotions — or anyone’s. I don’t think it does us parents any good to see normal emotion in that light, nor do I think it does our parenting lives any favors, nor does it offer anything beneficial to our children. So I’m chucking it completely… with one notable exception. Reaction Tantrums happen when our [whole, coordinated brain and body system, which Van Der Zwet calls the] Mega-System is hijacked by one of our brain systems. This causes our other brain systems and our body systems to either somewhat disengage or completely shut-down. In most circumstances (for those of us who are neuro-typical) Reaction Tantrums can be prevented or easily relieved. When these have habitually been prevented, or well managed, we have a strong foundation from which we can develop excellent physical health, wisdom, and maturity. Processing Tantrums happen when our Mega-System is forced, due to circumstances or new information, to radically change how it assesses and relates to the world. They can involve rewiring our brains and can be excruciating circumstances. Processing Tantrums are essential experiences which, when well managed, end with people who behave with increased wisdom, maturity, and for whom excellent physical health is their natural state. As Van Der Zwet points out — and without the usual judgment associated with the word — “tantrums” offer developmental opportunities and if “well-managed” (I love that term) lead toward physical, mental, and emotional health, maturity, and even wisdom. It doesn’t even sound like something to avoid when she puts it that way! It also makes plain that we have a vital role to play in those moments when our children are experiencing intense emotion — that is, managing it well. In current parenting mythology we still have these doltish ideas that babies and young children can manipulate us with their emotional expressions, and the best way to keep them from doing this is not to give in to these nefarious displays of defiance and coercion. We’re supposed to ignore them, punish them, or threaten them with “you want me to give you something to cry about? !” in order to make them stop exhibiting such unacceptable behavior and go back to being the compliant, pretty rag dolls they are supposed to be. As it turns out, though, as far as the child’s brain is concerned — none of the these methods contributes to a “well-managed tantrum”. The plain facts are these: 1) Young children don’t have even the remotest capability of planning and executing any manipulation whatsoever. That is high brain functioning, which isn’t even available in the sort of capacity necessary to pull off such a deception, even if young children were capable of thinking about doing it — which they aren’t. They can’t learn bad habits of getting their way just by being assisted in times of turmoil either. Seriously. 2) Ignoring their feelings and emotional expressions (however they show up), or threatening and punishing our children for displaying their emotions in ways that we dislike don’t do a single thing for getting rid of that “bad behavior”. In truth, all of those methods only make matters worse for everyone. They may even cause children significant neurological damage. Margot Sunderland, in her compelling book, The Science of Parenting, pooling data from several sources, makes a potent case for systemic and potentially permanent mis-development of the brain when children’s emotional expressions are ignored or negatively addressed. In one passage, Sunderland lists some effects of leaving a baby to cry without comfort: “high levels of toxic stress hormones wash over her brain; there is a withdrawal of opioids (chemicals that promote feelings of well-being) in her brain; pain circuits in the brain are activated just as they would be if she was physically hurt; the brain and body’s stress response system can become hard-wired for oversensitivity” (pg 38). Sunderland goes on to describe some of the possible effects of an “oversensitive stress response system”. The bottom line on all of that is simply that if we don’t address our children’s upset emotions, or if we withhold our comforting (to keep them from “getting spoiled” or “learning to manipulate us”), then we necessitate their turning up the emotional volume in the short term (to get the help they desperately need) and risk training their brains to have bigger, more volatile, more “unconsolable”, and more frequent explosive emotional displays in the future; we may even be pushing them toward later substance abuse (of various kinds) as their brains still try to secure access to the chemicals naturally produced during parental comforting. In case you’re wondering, when we do comfort our distressed little ones, the opposites happen instead. That is, we help them feel safe and secure and therefore calmer (even if they are still crying), so they don’t have to turn up the potency of their emotional expressions in general; and instead of training their brains to be oversensitive to stress, we train them to mitigate it themselves; and instead of leaving them vulnerable to addictive relationships with external sources of brain-calming chemicals later in life, we help them have a well-balanced, healthy brain, adept at maintaining it’s own ideal chemical stasis. In short — when we help our kids deal with upsetting feelings, we ensure their emotional processing doesn’t turn into “tantrums”. Need help figuring out what to do with your upset child? Or help figuring out how to reprogram yourself and your kid(s) in the face of over-sensitive stress response systems? You can start by checking out this post, and/or picking up a copy of All About Tantrums or The Science of Parenting. And if you really want to start making some serious changes — get in touch with me — I can help you figure out how to do it differently, and support you while you are working through it. In the meantime, I hope you’ll come to/easily be able to see your children’s emotional expressions as just the calls for help that they naturally are; and perhaps more importantly, I hope you’ll join me in setting the story straight on “tantrums”. This entry was posted in Parenting Ideas and tagged attachment parenting, building connection with children, childhood development, children, controlling children's behavior, cro-magnon parenting, emotional processing, empathy parenting, modeling, natural parenting, parent-child bonding, parent-child relations, parenting, parenting mythology, tantrums. Bookmark the permalink. i think i might have said this before, but i don’t believe in tantrums. obviously i believe in strong emotion and emotional outbursts; but i think “tantrums” are a social construct. in my experience they’re the product of parents mismanaging a child’s emotions…which i think is a parent’s job. not to say it’s easy – i personally find it very tough – but it goes with the territory as far as i’m concerned. in the uk there seems to be a fashion at the moment for calling emotional storms “meltdowns”, which i prefer to “tantrum” as it’s more descriptive and less emotive. but still, i don’t like the labelling of childrens’ emotions; it distances us from them, handily removes any responsibility we might feel from the equation; and i think it very unlikely that adult behaviour, no matter how undesirable, would be labelled in this way, with no regard for context or contributary factors. Precisely, Jo. I couldn’t agree more. In fact, I’d go back into the article and quote you, if we weren’t already saying so much the same thing! Glad to hear from you — it’s been too long! “Tantrums” are a great sign that a child is developing as he or she should be. It’s the limbic system in the brain firing up and sorting itself out. I’m not sure that it’s helpful to parents to try and determine between 25 different types of tantrums. Too confusing. It’s an emotion processing moment and if the parent is calm then “being with” is the most effective response. Unfortunately many parents have difficulties staying calm, and need to take their own time-out to calm before they can begin to respond empathically to their child. And as you say, how you respond depends on your attributions, the beliefs you hold about the child and why s/he is having the tantrum. You explain it all so well. I definitely agree that emotional expressions, eruptions, meltdowns, and über-visceral processing are all quite normal signs of proper development. I love that you say that. I get what you are saying about “25 different types of tantrums” — assuming you are referring to Karyn’s book with this — and I totally agree that for every one of them the most effective response is to be with the kid having whichever kind it is (even if that means you are “being with” her desire to have some processing space…). At the same time, though, the way All About Tantrums proceeds, a parent doesn’t have to quickly scroll through the book to find the right tantrum style and plug in the appropriate formula before the kid explodes. I assume that if you have a teen, you just read-up on the teen section, get a sense of the kinds of things to expect and some ideas for dealing. I don’t think more than a few parents will consult the book during an emotional processing event, but maybe I’m being naive about that… At any rate, I’m the kind of person who loves to have the broad view as well as the specific — so both your general edict and Karyn’s combing through the minutia appeal to me. Thanks, as always, for your contribution(s) and your encouragement, Narelle. So great that you appreciate the bits of All About Tantrums that you have read. Do let me know what you think when you’;ve had a chance to read and digest. And Hi Narelle! I agree that 25 types of tantrum might seem overloading at a glance, but Nathan has hit the nail on the head with his assumptions about parents being able to look up the chapter headings and going for that chapter. Apart from the first section, which goes into brain and body processing systems, I have tried to use the terms that I hear other parents using a lot when they speak about their kids and explain what is going on for the child in each situation. This way, I hope that parents will be able to bring more understanding and less reaction to ‘tantruming situations’, over time. (Attention Seeking; Boredom; Low-Blood Sugar; Transitions etc) It will be intense information overload for people who have not ever heard of attachment but it is set out so people can use it as a reference – not meant as a one-off read. I also include some strategies for helping parents calm when faced with their children’s intense reactions. Thanks again, Nathan, and great to have the three of us back on a blog post…all at the same time! You are certainly most welcome. I am so pleased to spread the good word and help more people find out about your important book. And it just so happened to fit in perfectly with what I wanted to say, so I was doubly glad to mention it. Thanks for addressing Narelle’s bit, too. I was pretty trepidatious about speaking for the book or you, but wanted to at least clarify my interpretation thus far. I was so glad when I saw your comment, and got to read your take on it. I actually think that discussing the various types (in the book) will help most parents get more comfortable about the various emotional expressions they are likely to see. And I totally agree — when I saw that you had joined in on the comments with Narelle and I, I actually said, “It’s just like old times!”. So fun to then read you mention the same thing. Great to hear from you, Karyn. Congratulations on your book. Keep on keepin’ on! Nathan this is a very interesting informative read. thank you!! So glad you’ve found it helpful, Lelia! You’re so very welcome. Hi….my son who is 4.5 years old seems to be at rage at all the time when he is home….he is full of energy and beats his brother up….none of us are violent at home so i don’t know what to do about it? I am always forced to raise my voice in order to distract him. He is hitting…jumping….pulling and tripping his younger brother who is 3 yrs old. I feel so stressed all the time thinking about this….i am going crazy and feel so depressed…i dont like physical punishments so i yell but i am tired of yelling constantly “stop…plz dont hurt ur brother” plz stop ….please don’t” etc…. Without knowing more, I can offer two things that might be of use to you. On the one hand, your older boy has got a need (or more than one) under all that raging energy and physical roughness. If you are able to do some investigating with him, you might be able to find other ways to help him meet the underlying need(s) without him having to resort to beating up his younger brother. It might be a need for physical connection (maybe even from you), or to feel significant, or to move and play hard… One way to look for the underlying need(s) is by getting curious about what he’s feeling when he’s doing the raging. See if there’s something he’s suffering over and trying to let out, or if the unmet need is causing emotional distress, or if he just feels wound up and excited. This will give you insight into how to approach addressing it. Also, and I don’t know if this is part of what’s involved for him or not, but lot’s of close-age elder siblings have some very hard, distressing, even scary feelings about their younger(s). They can feel replaced, or in danger of it, or as if they don’t matter as much as “the baby”. Naomi Aldort does an excellent job of discussing and suggesting ways to address this here: https://www.youtube.com/watch?v=b9PkQEIIflw . I often work with parents struggling with this same sort of thing. It can take some time to unravel. But there are certainly things you can do to change the situation regardless of what’s at the root. Feel free to contact me if you want to discuss it further.